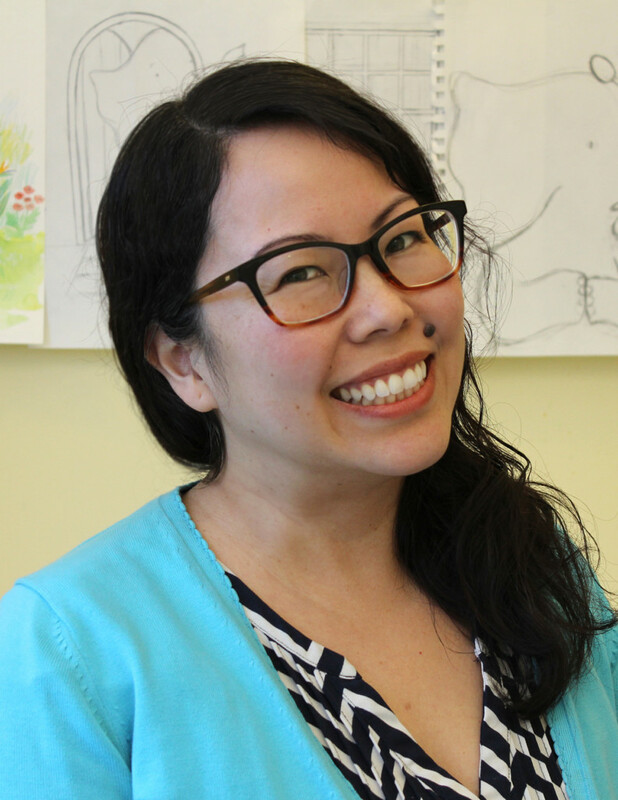 I am “quackers” about today’s guest, Liz Wong, and her work. As a volunteer in my granddaughter’s school library, I’ve noticed that Liz’s first picture book (Quackers/Knopf) is one that students wrestle over weekly. So I am delighted that we are celebrating her newest picture book, Goose Egg (Knopf Books for Young Readers). And even better news: Liz has generously offered to give away a copy of Goose Egg! To enter, click on this link and follow her on Twitter! 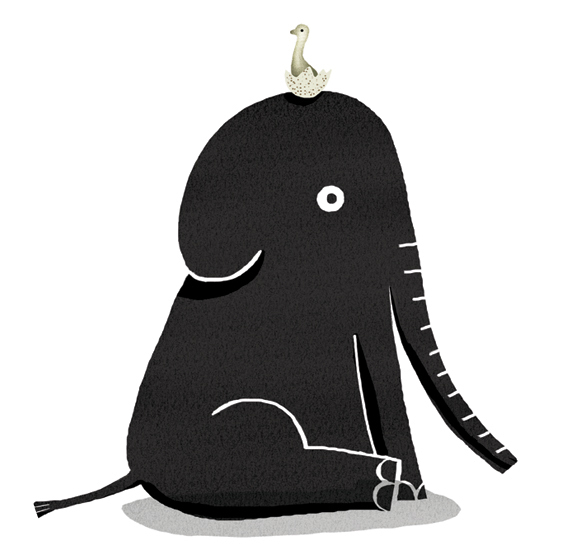 I got the idea for The Goose Egg (Knopf Books for Young Readers) when one day I drew an image of a newly hatched bird sitting on top of a very surprised elephant’s head. I don’t know where this drawing came from, I just had the urge to draw it and there it was. It was just something I drew for fun and I didn’t expect anything to come of it, but I found I kept thinking about these two animals, trying to puzzle out their relationship. 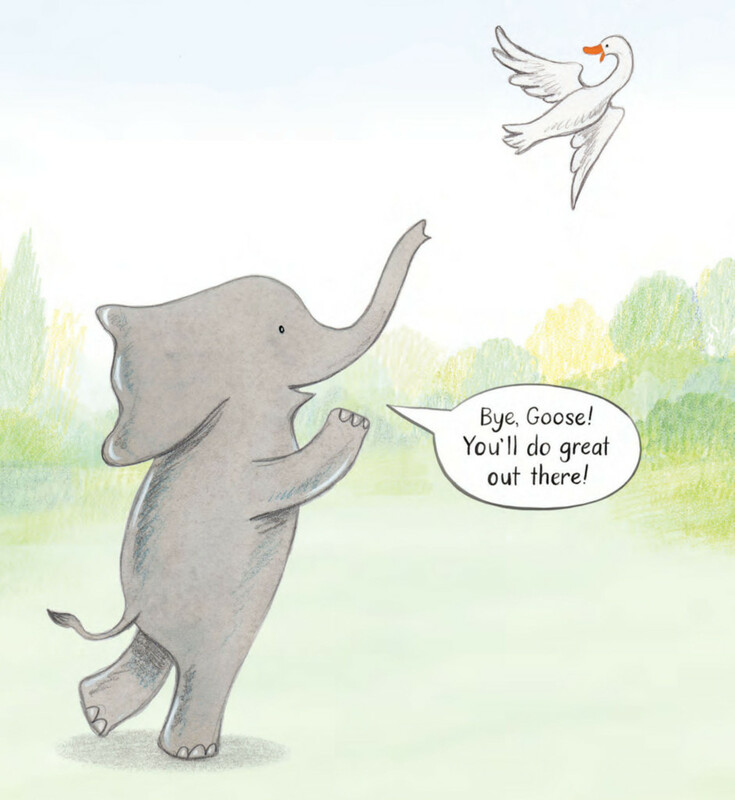 From there a story began to grow, about an elephant becoming an accidental parent to a goose. Logistically, trying to figure out how an egg would end up on an elephant’s head turned out to much more difficult that I originally expected. 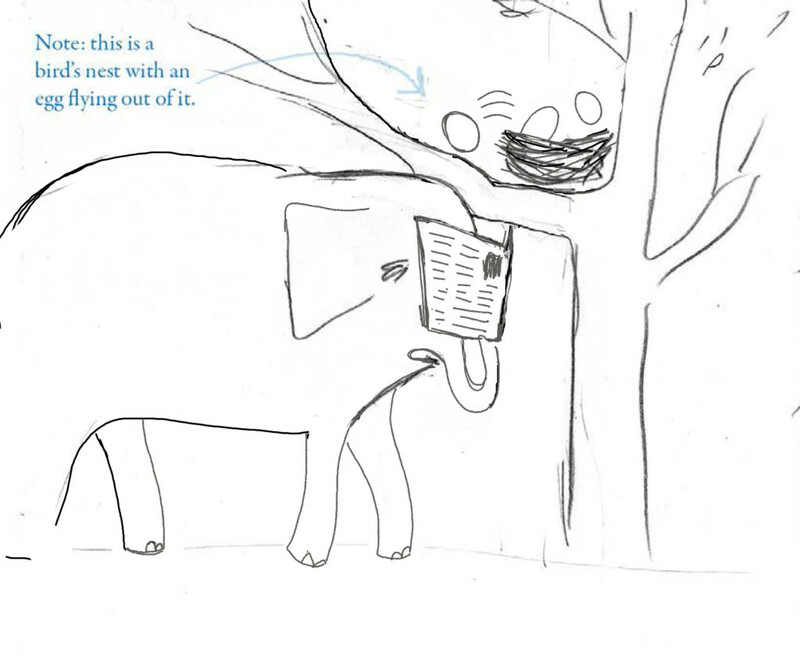 In my initial drafts, the elephant, Henrietta, loved drinking tea, reading the newspaper, and taking walks. She hits her head on a tree branch while attempting to read the newspaper and walk at the same time, and the egg flies out of a goose nest. But whenever I showed the story to someone else, they would ask, “Do geese nest in trees?” The answer is yes, there are geese who nest in trees, but I eventually admitted to myself that readers wouldn’t always have me standing over their shoulders explaining the finer points of goose nests. I needed to find a different solution. 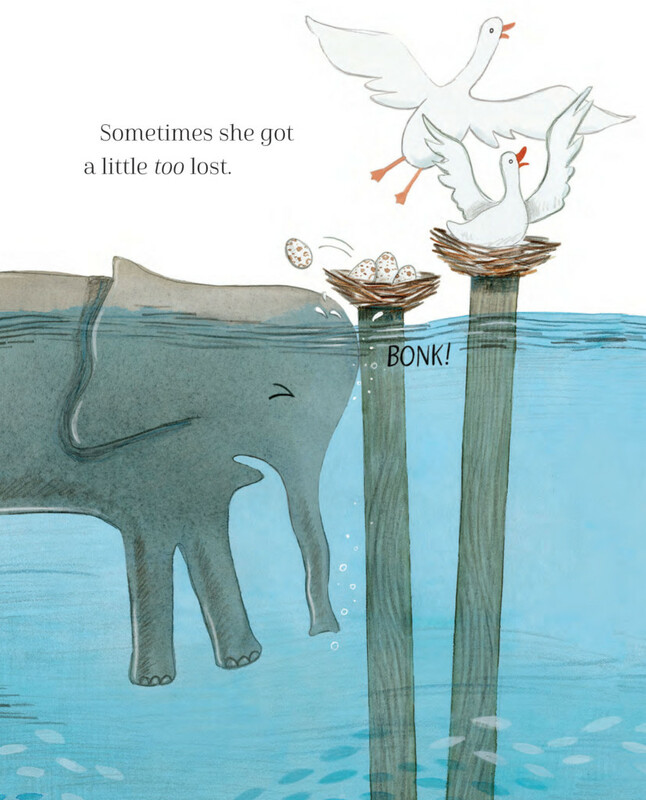 As I was discussing this problem with author/illustrator friend Corinna Luyken, she suggested that the goose nest be located on a dock near the water, and the elephant could bump into that while swimming. I incorporated Corinna’s brilliant suggestion into the next draft, and Henrietta’s habit of walking was replaced with swimming, and the tree was replaced with a piling in the water. Thank goodness for author and illustrator friends! Goose nest logistics aside, at its heart this is a story about parenting: the chaos that erupts when a new baby arrives, the challenge of learning how to be a parent, the joyous moments that parenting brings, and the love that grows between a parent and a child. Much like the parenting experience itself, crafting this book was a series of struggles and joyous moments, in equal parts painful and delightful. And now it’s off in the world to find its own wings. Liz Wong was born in Honolulu, Hawaii, where she spent her early childhood painting and clambering about in mango trees. Winning the first place trophy in her elementary school poster contest encouraged her to pursue art instead of a sensible career in finance like the rest of her family. Liz holds a BFA in Art and a BA in Anthropology from the University of Washington and currently resides in Edmonds, Washington with her husband and son. She can be found on Twitter and Instagram or her website. Go Liz! Go problem solving! Go friends who help! So charming! Can’t wait Liz! You know – or I hope you do by now – how much I love your work and humor, and you, dear Liz. Congratulations on GOOSE EGG!